Ordinarily, inference rules in natural deduction are written using a horizontal line, with the known, true, assumed or proven things written above the line and the inferred things written below the line. 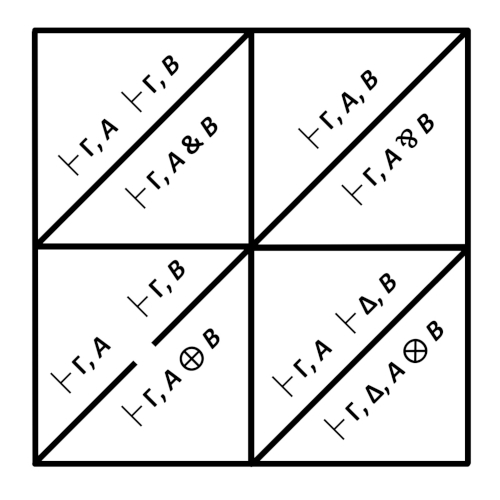 Here I’ve taken the artistic liberty to use diagonal lines instead of horizontal ones, and so tried to represent the introduction rules for the four binary operators of Linear Logic. In order to fit additive disjunction “plus” into this schema, I’ve broken the inference rule diagonal and written the duplicate inferred introduction below only once. I’m sure no self-respecting logician would do such a thing. This entry was posted on April 6, 2019 at 7:48 AM and is filed under eightfolds, fourfolds, linear logic, logic. You can follow any responses to this entry through the RSS 2.0 feed. You can leave a response, or trackback from your own site. Further research in the URLs you provided led me to read about Heisenberg’s Uncertainty Principle – one of my early memories from high school physics and a really amazing concept. It is these rediscovered in this creaking phase of my life that makes your blog good mental stimulation – THANKS!